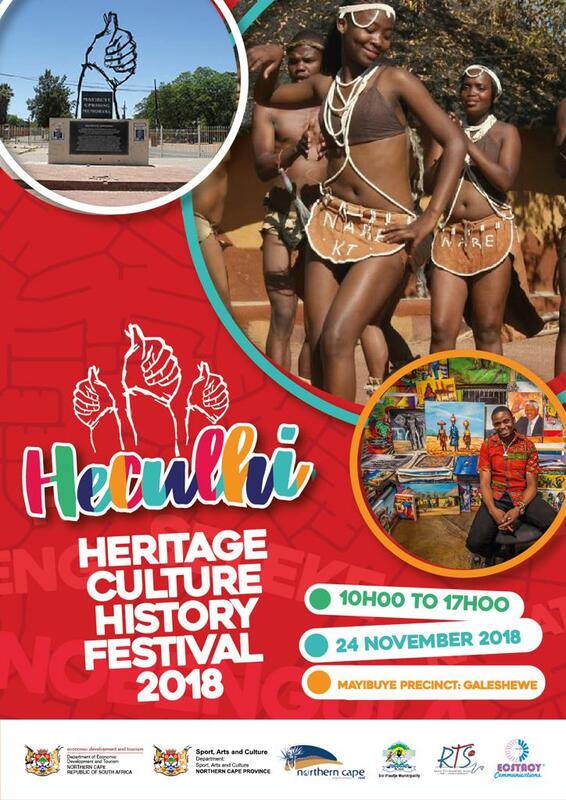 Hordes of attendees descended on Galeshewe’s Mayibuye Uprising Precinct for the inaugural Northern Cape Heritage-Culture-History (HECULHI) Festival on Saturday, 24 November 2018. The event stood out as a spectacle of an artistic mix of storytelling through stage play, cultural poetry and dance and the selling of art and craft, clothing and other goods by Galeshewe based traders. “Township Tourism is our key strategy not only to market our township tourism destination but also to develop the township economy. Moving forward, we will continue to revive, sustain and promote tourism activity routes such as the Galeshewe Activity Route and other historical routes in other parts of the province,” declared MEC for Economic Development and Tourism Mac Jack. HECULHI is supported by the Department of Economic Development and Tourism in partnership with that of Sport, Arts and Culture owing to it bearing the promise of being a future tourist drawcard and cultural spectacle. The Northern Cape Tourism Authority (NCTA) added personnel and aura to the event. “As a fairly new initiative from the Department of Economic Development and Tourism and other stakeholders, I would say that the objective has been achieved. The programme attracted talent which the Department of Sport, Arts and Culture could utilise in future. “We are also pleased with the turnout and how people value what our government is doing for them. It is our responsibility as implementing agents to assist and that also goes for whoever that is appointed in future in doing it as an annual event,” said HECULHI organiser and representative of Ecstacy Communications Caution Lesaoane, who hailed the event for having been a success. Notably, with HECULHI also posturing as the township economy’s mirror, it was also heartening to note the effort undertaken by prominent disc jockey Robby Khoza in having packaged and labelled his family blend of homebrewed ginger beer, Kenika Sweets Fairy, which was also on offer for those wanting to quench their thirst. Across the divide of age and tribe, cultural groups from within Galeshewe and elsewhere, strutted their stuff in vying to be the best. On the history front, the storytelling was not the usual spoken word but melodically staged with aplomb. “This should be done on a bigger scale, market it more so that more people should know about their cultures, heritage and history. “We have shows about the Robert Sobukwe’s and young kids will get to know who Robert Sobukwe was,” enthused the Disney’s The Lion King famed Bangiwe Ka Jobela who is also the co-founder of the trending Amandla Danca Teatro ZA (ADT ZA). The young and old at HECULHI witnessed ADT ZA’s musical uMangaliso The Miracle (a play celebrating the life and times of the Pan African Congress founder Robert Mangaliso Sobukwe who died in Kimberley in 1978) their current production in which they cast Emathongeni (the children). Sobukwe’s law offices and the Mayibuye Uprising Memorial (the massacre scene where 13 anti-apartheid protestors were gunned down on November 8 1952) are the key attractions at the Mayibuye Uprising Precinct and an integral part of the Galeshewe Activity Route. Despite it being early days for HECULHI, it bears the promise to fetch up with events positioned similarly beyond the borders of the province. And, in defining itself as the connector to our yesterday, today and tomorrow; with room for improvement it could shine as the province’s living repository of heritage, culture and history in proudly being everybody’s HECULHI. Having community radio amplifying it as was the case with Radio Teemaneng Stereo doing an outside broadcast from the precinct, the necessary awareness spark has certainly transmitted the event into the future. Ladies from one of the cultural groups that performed at HECULHI. 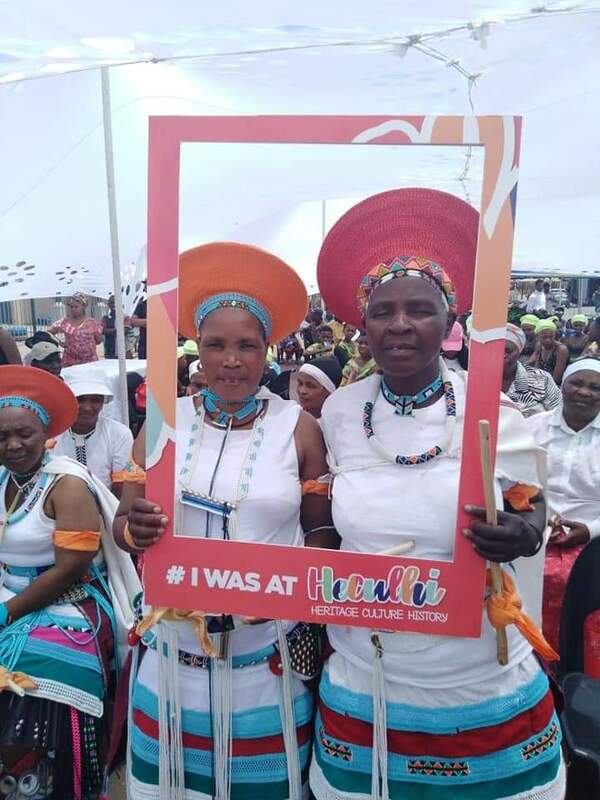 HECULHI: Cultural groups across age and tribal divide celebrated and showcased culture and heritage.